The Hot Aches team were back in Suirana, Spain last week to catch up with Dave MacLeod who had been out there for some time attempting to climb Rich Simpson’s A Muerte. Our blog readers may recall that Dave had tried this line in the past. The route is a steep and relatively short line. 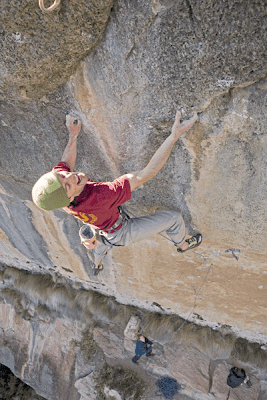 Just 21 moves take the climber up first through f8b climbing, then into a 6-8? 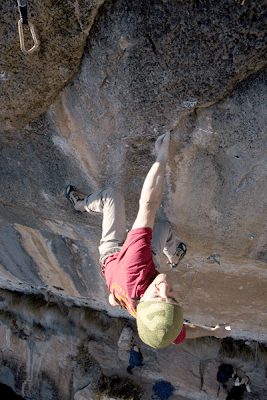 move crux sequence, before reaching a jug and shake-out. Thereafter it is only f8a to the top. As Dave said, you won’t be pumped when you reach that point, because if you are pumped you won’t reach that point. Simple? This filming schedule was going to be super tight. Only 3 climbing days were available for Dave before he returned home. Filming routes at this kind of level is always going to be a real gamble. But if you’re not prepared to gamble then you never get any really interesting routes filmed (unless you want to re-shoot them after the event – but that is somehow never quite as good). 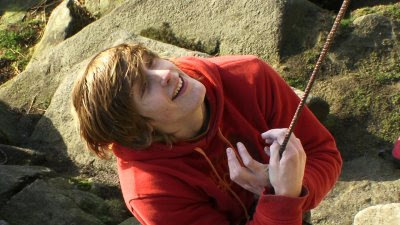 On our first day out we rigged the route and filmed a couple of failed redpoint attempts. 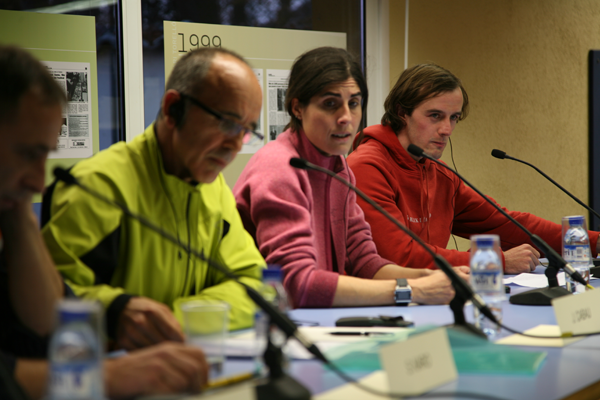 After that we all had two days of ‘work’ at the Torrello Mountain Film Festival. 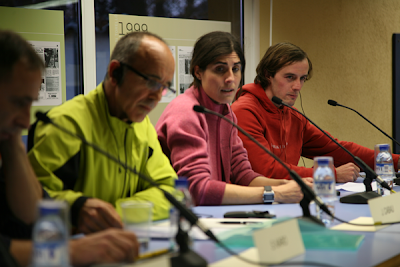 At least one of us 'working' at Torello Mountain Film Festival. Josune Bereziartu and Dave MacLeod. Interestingly Josune is more motivated by mountain trad that by hard sport climbss (if the audio translation was correct). Photo Hot Aches Images. Work in this case seemed to involve 4 hour lunches and copious amounts of wine. The Catalans certainly seem to have perfected the art of hospitality. 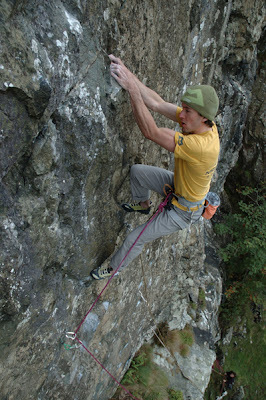 After that it was back to the crag and Dave’s enforced rest period had clearly paid off. On his first attempt of the day Dave dug deep, and not distracted by tracking cameramen being winched around on pulleys he quite literally sprinted through the 21 moves to arrive at the shake out. It was freezing cold, even too cold for the Scotsman. He spent a while at that rest trying to warm his fingers and regain sensation before launching into the top section. 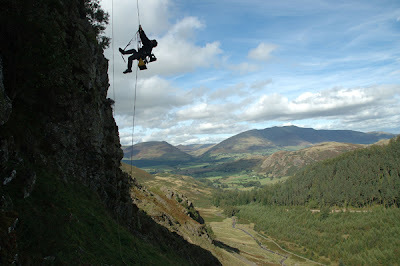 Emma was a very nervous belayer at this point, quite literally shaking. But there were no mistakes, of course. And so Dave MacLeod has now climbed his first 9a. 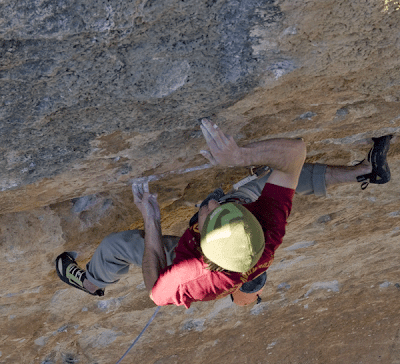 A fantastic route and a test-piece that has spat off many accomplished climbers over the years. We think this is the fourth ascent. The line was bolted by Tony Arboles several years ago. 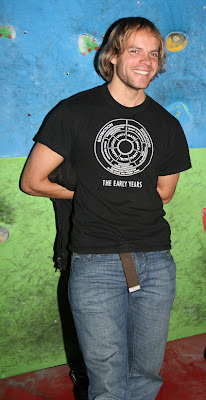 In fact Tony says that is was the first line to be bolted on the famous crag of Campi qui Pugui. And whilst routes there such as Anabolica 8a have had over 500 ascents, this line remained unclimbed until 2006 when Rich Simpson grabbed the very prestigious first ascent. One note on the climbing sequence. Dave had made some interesting progress using a different sequence to the previous ascentionists. A horrendous looking two finger match, when it worked, allowed him to bypass 2 of the holds on the crux section. 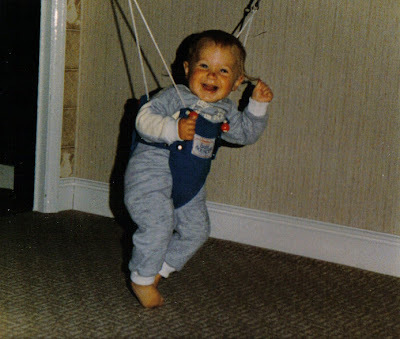 But by the time we arrived Dave had decided that this method just wouldn’t work and had gone back to the normal method. I asked Dave about the relative level of difficulty in comparison with his other routes. I’d prefer him to put these in his own words rather than paraphrase, but ‘not much harder than Rhapsody’ [his E11 at Dumbarton] was one of the several interesting comparisons that he made. Congratulations to Dave. It was a great piece of climbing to witness. The footage is destined for one of our current film projects, probably for inclusion in Committed Volume 2 which is featuring a range of different climbing disciplines at locations around the world. ps. thanks to Emma and Caroline for all he help in rigging and belaying. The autumn round of major film festivals is almost over. The Hot Aches team have been flitting around the world, to USA, Canada, Kendal in the UK and then this week to northern Spain. E11 continues to pick up awards, and we will be screening this at the prestigious Torelló festival in Spain next week. Dave MacLeod will also be giving a lecture (in his best Catalan!? should be interesting). 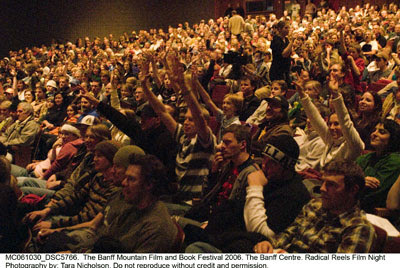 'Ice Mines' had it's world premiere at Banff and was really well received. This Will Gadd film is about an underground ice climbing expedition (yes, subteranian) in Sweden, and was filmed by Dave Brown and Slackjaw's Ben Pritchard. Gadd himself is in the UK at the moment, lecturing and judging last week at Kendal, and then to Dundee Mountain Film Festival this week. 'To Hell and Back' had it's big screen premiere at Kendal. Watching this certainly brought back some disturbing memories. This 60 minute program is edited for TV, and I will check up on the latest news on plans for it to be broadcast nationally on BBC. Meanwhile you can download the full movie at reasonable resolution here. 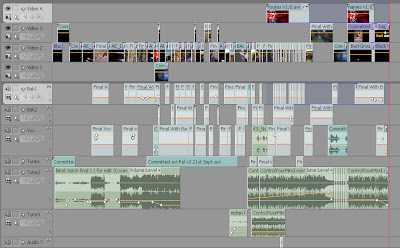 A 60 minute edit from the DVD has been played at Banff and Kendal. A short edit is touring northern america on the 60+ date ReelRock Tour. 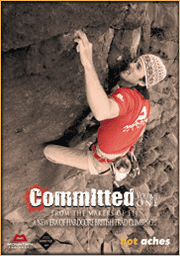 Committed:To Grit is now playing many dates on the Banff World Tour. 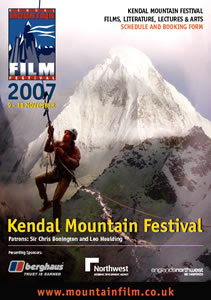 And finally, Committed:Keen Youth picked up the award for "Best Short Film" at Kendal Mountain Film Festival. Wow, it's been a busy autumn. One of the great things about the autumn round of film festivals is that it gives us the chance to re-charge our batteries and enthusiasm. The ideas are flowing; lots of plans for new movies (plural). Lots of big decisions to make. 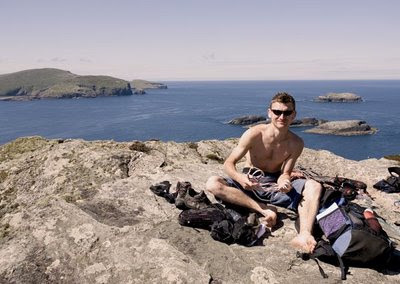 In the second of our series of Committed podcasts, Niall McNair talks about climbing on the Hebridean Island of Pabbay, and his new multi-pitch route on an unclimbed seacliff; Redemption Arc, E6 6a xs, climbed onsight. "Redemption Arc' takes an completely unclimbed wall, severly undercut. The really beautifull thing is that that rock has been there for billions of years, and just knowing that our hand were the first to be on it was quite a unique feeling. " "...the birds and the wildlife really add to it as well. You'll get dive bombed by bonksies, you'll get puked on by fulmars, but you also see basking sharks and otters and seals and all sorts of wildlife, and so you can sit on that belay ledge for hours and hours and just watch the wildlife around you." You can watch Niall climbing on Pabbay at the Edinburgh Mountain Film Festival this Saturday night, as part of a special cut of our film Committed. You can also read more about Pabbay and Redemption Ark in our blog entry following our filming trip back in June. Committed Volume 1 DVD will be hitting the shops in the next few days. 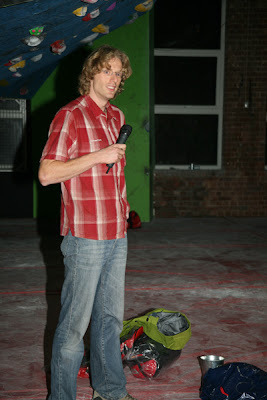 On Sunday, the Climbing Works in Sheffield played host to the world premiere of Committed. It was great to be able to screen the movie there. Firstly because Committed features climbing from all over the UK, and so Sheffield is a good central location for the featured climbers and people who helped out with the film to get to. Secondly it was a really good venue for this type of event; less formal than a cinema, more of a relaxed atmostphere. Thanks again to the film sponsors, Mountain Equipment and Gortex, and also to the event sponsors, Mountain Equipment and Outside, and Heason Events for organising the whole event. Mr Heason events himself; Matt Heason, compering the gear give away during the half time raffle. 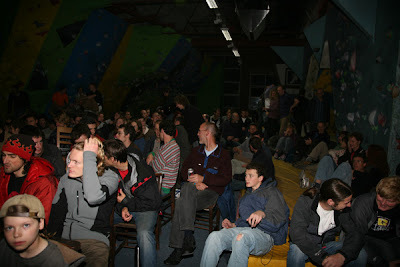 The turn-out was great, and by all accounts the venue worked really well for this type of event. Sam and the team at The Works are now going to look to install permanent screens for more events like this. Well, yes. We are finally finished. The Premiere of Committed is just 2 days away. Dave B is just back from America where he has been eying up some stunning unclimbed winter lines - back to Colorado quite soon, or maybe not so soon, tonight's first training session with axes was a rather rude awakening. Paul D is just finishing his first climbing comp of the season. I left Alien Rock (Scotland) early, after Paul had flashed the first 2 problems. Maybe this year? Or maybe 3 months of sitting in front of a computer monitor editing the moves of greater mortals will have taken it's toll? 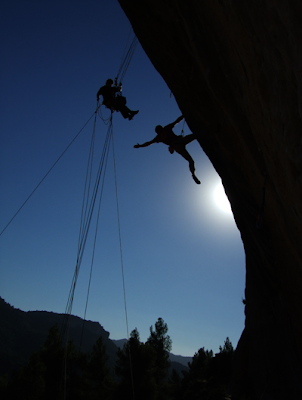 Fortunately, as film makers, there is no obligation to be good climbers as well. I can think of only one film maker in the world who is rude enough to also climb really well - I'll resist the temptation to out him. He lives in Sheffield, that's plenty enough clue. So we have an alpine-ish start planned for tomorrow; to The Peak and the promise of good weather. 2 days of climbing, with our super-psyched friend who couldn't care less about climbing movies; she just despairs at why we wont get up at 4.00am so that we can drive down and get a full day of climbing. Sorry to sound jubilant, but yes 'our work is done'. It's been a great year filming, and a horrendous summer editing. Right now, the thought of that the sensation of friction, when everything sticks and the seemingly impossible happens; that seems more important than any magazine review or sales statistic. In this new series of Hot Aches podcasts we are bringing a whole series of 'extras' to accompany the new movie Committed, due out next week. 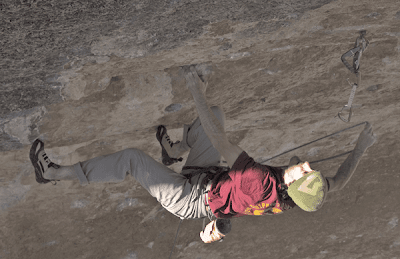 In this first podcast, James Pearson talks to the camera in the twilight after his late evening ascent of what is probably the hardest route on Grit, The Promise, E10 at Burbage North. "For the last few years I've been trying to find something on grit that's really hard - a really good line - quite a standout feature, rather than some poxy squeezed in eliminaty hard thing, something really outstanding to do. I'd been racking my brain for ages, so to finally manage to do something like this really cool looking arete it's really good. To try and leave my "mark", if you know what I mean. Because there's not much stuff left on Grit, which is a shame because the climbing is so nice and the routes are all really good; there's just not much left of great quality. I'm happy I've done it." You can also read Hot Aches account of that day back in January 2007 here. Check back here regularly for more Committed extras podcasts, or better still, sign up for our newsletter (box to the left) and we'll keep you updated. Sorry to have to report that the european stock (PAL) of Committed has been delayed at the manufacturers (in Germany) by a few days. All orders from on-line retailers (HotAches.com DaveMacLeod.com etc.) were due to be posted out on 13th Oct. They will now go out on 18th Oct.
Stock should be hitting the shops around the 20th Oct. In USA, stock (NTSC) is on schedule and is going out to retailers today. Apologies for the delay. Frustrating. Our latest climbing movie, Committed, will be showing at films festivals and special screening around the world over the next year. This is our world premiere and after introducing the film we will be showing the full 78 minutes with an interval at half time for a beer and a natter. This should be a fun and informal night. 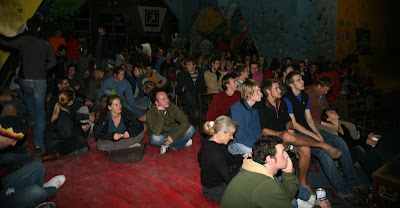 There will be several of the climbers featured in the film attending. I’m really looking forward to showing folk the film for the first time and hearing their reaction to it. At the EMFF we're showing a special 30 min cut of the film with some of our favourite chapters and particularly those that are set in Scotland or feature Scottish climbers. 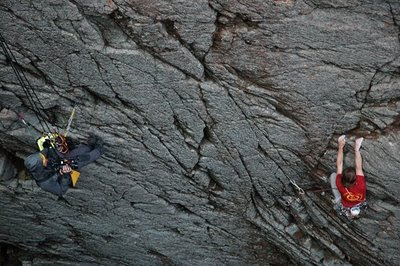 Several Climbers from the film will be there, including Dave MacLeod, Niall McNair, Alan Cassidy and Kev shields. Committed will be shown several times through out the main weekend, details still to be confirmed. I hope to see you at a screening somewhere or at least in the bar after. During the last couple of weeks our last film, E11, has continued to tour round the world and has now brought the collection up to 13 international awards. Also showing at Taos was the first outing for the new Sharma movie 'King Lines' (the first outing outside of the ReelRock Tour). 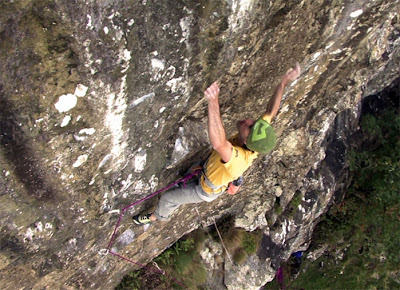 No surprise that this great new movie went down really well and took the 'Best Climbing Film' award. One of the special guests presenting this year was Sir Chris Bonington, covering 'The Everest Years'. I'm amazed to say that I dont think I have ever seen him lecture before. Quite odd that this first time will have been half way around the world from where we both live. ...Oh, that 'unusual award'? Well. It was very flattering. But I think I will be more happy about it than Diff: A portrait worth $25,000(?) by artist Jack Smith. I can't imagine that Diff will be particularly keen to have a painting of Dave Brown hanging on his wall. So I guess I get to keep this one. He can have the trophy from Poland. E11 will continue to tour a few more countries this autumn. But it looks like Taos will have been the last place that we will visit to present that film. Next week we premiere the new movie 'Committed' in Sheffield, England. It's been an insane year of filming and editing. You can now buy on-line direct from our web-shop. Guarantee your copy early by pre-ordering now. (last year sales of E11 were crazy and we had to rush to get more stock made). All pre-orders will be shipped on October 13th. 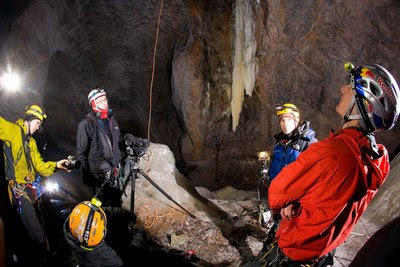 Many thanks to our sponsors, Mountain Equipment and Gore-tex for their support in making the film. See our films page for more details about the movie. For media see our press kit here. For retailers see our DVD Info Pack here. We are delighted to be premiering Committed in Sheffield, England at The Climbing Works. Date is 14th October, 8pm. Tickets will be in short supply, to get yours contact The Climbing Works. See Heason events for further details. A lot of people are going to be travelling there for the weekend, so come and get some climbing done, outside or in - then have a beer and watch the full movie. We will also be selling copies of Committed on the night at a special one-off price for ticket holders. For more information sign up to our newsletter below. The movie will also be playing at a number of film festivals around the world this autumn. 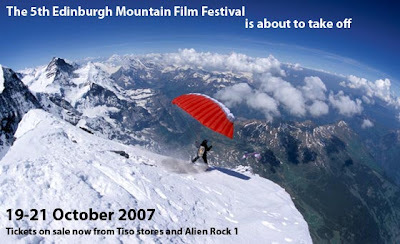 Edinburgh Mountain Film Festival, October 20th. Committed is shortlisted here for the 'Best Film' Award. 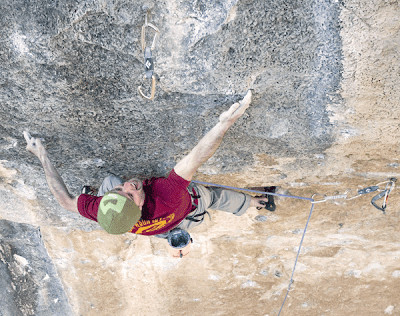 A special short cut of Committed is touring North America along with King Lines, the amazing new Chris Sharma movie from Big Up and Sender Films. This is running over 60 dates, so a lot of you should be able to get a preview of what is in store on the DVD. Check out the tour calendar. We are finally out of 'editing hell' so now have a bit more time to bring you a lot more information about the new movie. 100 hours of footage were shot for Committed, and obviously there is so much that didn't make it into the final cut. So we are going to bring you a series of regular pod-casts. Be it 'what happened next' after a climber plummets to the ground, or an in-depth interview with Johnny Dawes, or the making of the movie, there are lots of goodies to look out for. Sign up to our mailing list (the box to the left of this text) and we'll keep you posted on the latest happenings, plus some special give-aways too. ‘One man’s E9 might well be another man’s E11’ was the controversial quote from Bill Birkett in last year's climbing film ‘Set In Stone’. I can't imagine which two men he was refering to. There has been plenty of speculation about how hard Dave Birkett's major routes in the Lake District really are. Inevitable speculation considering that they have remained unrepeated, some from as long ago as 1992. Just why that is the case is something of a mystery. Fashion? Convenience? I imagine though, that the claim that Dave MacLeod had ['tried'] Birkett's hardest route, 'If 6 Was 9' must have irked somewhat [because most people do interpret 'tried' - as therefore 'failed'.] The truth was that Dave called in and played on the route briefly on the way home after climbing Breathless earlier that day. So perhaps it will come as no surprise to people that when the time came for Dave to think about visiting the Lake District, If 6 Was 9 was top of his list. In fact, the Hot Aches Team were on standby in early summer to go and shoot Dave there, but the weather window never materialised. But in the last week we all finally made it down there. After a trying time on our last shoot in the Cairngorms, it was nice for normal service to be resumed. Although the route is extremely dangerous, the level of climbing, 8a+, was well within MacLeod’s comfort zone and so we got to film a really enjoyable ascent. The verdict on the grade; ‘solid E9’. As always, MacLeod’s writing provides a fascinating insight. You can read his perspective on his blog. 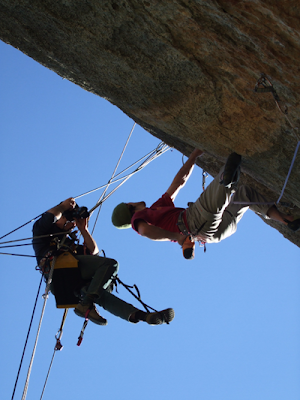 For A great route to film too; we rigged a rope system taking the cameras way out from the crag into space. We also had the luxury of 4 cameramen on the shoot, so expect some killer footage. This scene is just too late to make it into Committed Volume 1. That movie is now finished and away to be manufactured (watch this space). So now the filming for Committed Volume 2 is underway. More filming is lined up in the next few days. Maybe some time soon we’ll give ourselves a break huh? Thanks to Matt Sharman and Nadja Stracey for coming out and filming... they have the honour of been the first people to earn a credit on Committed Volume 2.